This is the twenty seventh post of our series of projects to make us thankful for DIY. Be sure to check back everyday during the month of November for new simple and easy DIY projects. For this project, you'll need only to stop at the home improvement store to pick up a few items in the plumbing section. If you purchase a 5 foot pipe length and then cut it down to size using a pipe cutter, you'll have the pieces you'll need at an affordable price. You can purchase any pre made crate or make one yourself in the workshop. We built several DIY crates in our rolling cart storage bin build and you can use our design plans. Stain your crate the night before and then the build goes quick the next day, once you begin cutting and assembling the copper tubing lengths that make up the bottom of this table. 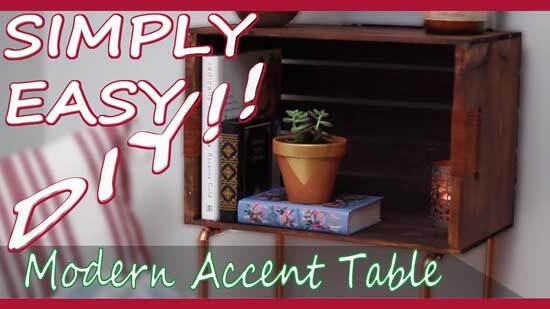 Use this accent table in the living room or position it in the bedroom as a bed side table. Have a child that is going off to college? This one fits in the dorm room. Wood Gel Stain "Dark Walnut"
NOTE: If you want a Simple and Easy DIY version click here. I hope you enjoyed today's featured project and don't forget to stop by "Katie Bookser" YouTube channel to check out even more great crafting videos from her. Don't forget to subscribe.